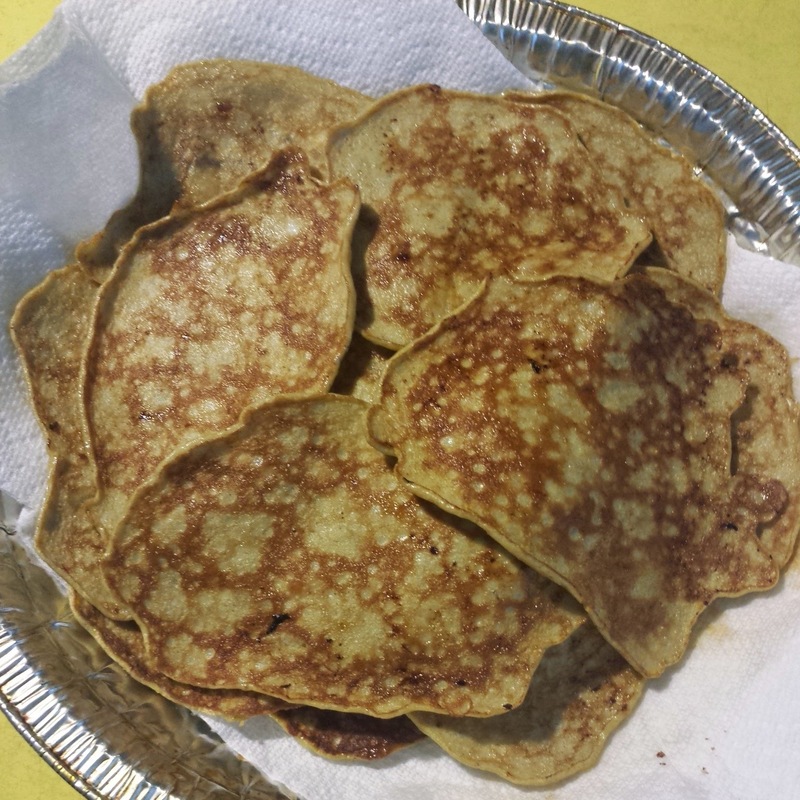 These are unbelievably simple pancakes, the recipe for which I got from Cassey Ho (@blogilates) on Instagram. All you need is 1 banana and 2 eggs (or 2 bananas and 4 eggs, if you're cooking for more than one person like I was). Mash the banana(s), mix it with the eggs, and you've got your batter. Then spoon the batter into a pan like you would with any other pancakes, cook for desired brownness and flip to make it even. Repeat until the batter runs out, and there you have it. I ended up with 14 sweet little round things. I tend to make my pancakes kinda small (no larger than the palm of my hand), so that's what I did. 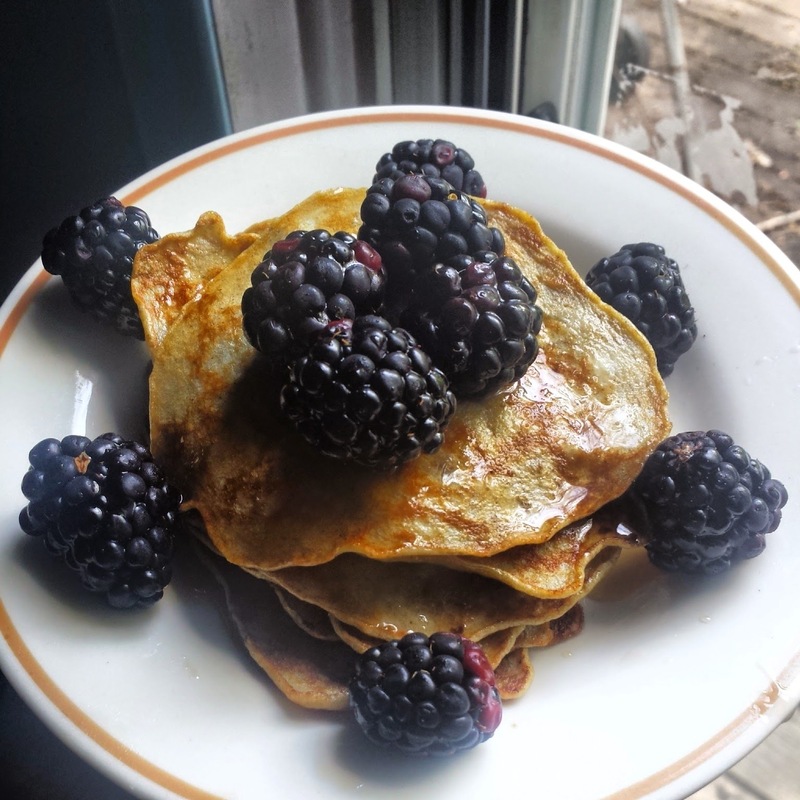 To finish I topped them off with blackberries and a little syrup. As I usually do when I make something, I let Ma try it first. She said they were just aight. I think when I told her I was going to make pancakes this morning, she might have been expecting something big and fluffy. As a result, the thinner, firmer texture of what I made wasn't her cup of tea. Plus Ma generally doesn't care for fruit in her food, so she was definitely not impressed with the banana flavor of the pancakes or the blackberries that I added on top. I, on the other hand, thought they were delicious! If you're someone like me who likes fruity flavors and isn't opposed to a lighter version of pancakes, then I would definitely recommend these. Thanks, Blogilates! This recipe comes from Food Heaven Made Easy (two sistas? with their natural curls? sharing their health and nutrition knowledge with the masses? yes, yes, and yes to all of that!). I came across it through a BuzzFeed article about what "real healthy people eat" (-_-). Imposed standards aside, the article offered quite a few interesting ideas for healthy dishes that are relatively simple to make, nice to look at, and fun to eat, and this egg in avocado dish was the one that intrigued me the most. It looks fancy, but just like the pancakes, you can make this dish easily. Take an avocado, slice it in half, remove the pit, and scoop out enough flesh from each half so that an egg can fit inside. Crack an egg into each half, then sprinkle on some garlic. Add some chopped cherry tomatoes and then put the two halves in the oven for 20-22 minutes (I ended up doing 25). Top it off with cilantro, salt, and pepper as desired and done! Ma actually really liked this one, so thankfully I wasn't completely 0 for 2 this morning. Thanks, Food Heaven!